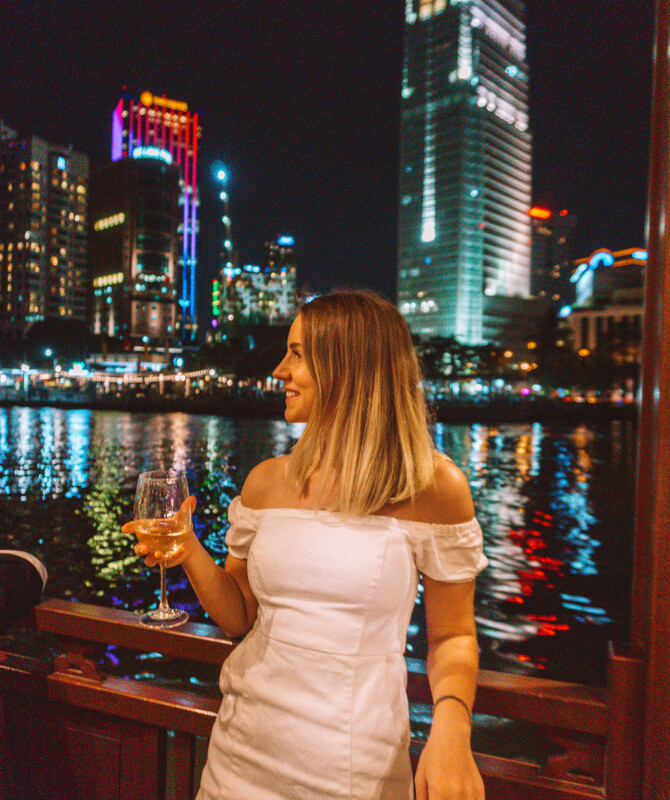 The Bonsai River Cruise offers the ultimate romantic night out in Ho Chi Minh City: an evening sailing down the Saigon river, sipping wine and eating delicious food, with a backdrop of the twinkling city skyline floating past. Being a single-little-pringle, it’s not often I get to indulge in these romantic experiences. So when Bonsai invited me to check out their dinner cruise I jumped at the idea of a romantic friend-date with Laura, from Willful and Wildhearted. Disclaimer: I was hosted by Bonsai River Cruises for this tour. All experiences and opinions expressed are my own. Prior to my experience aboard the Bonsai, I was completely unaware of the challenging few years that the company has endured. In 2015 a rogue boat smashed into the Bonsai and its sister ship, the Artisan. Both elegant dragon boats were destroyed, rendering the high class Bonsai cruises in-operable. But now Bonsai is back, bigger and better! The new boat echoes the elegant style of the original Bonsai, exuding the romance of the Indochina, while merging European and Asian influences in both design, menu and entertainment. Arriving at the Bonsai cruise boat was like being transported back to slower, more elegant era. The Bonsai boat captures the luxury of the early 20th century in its vintage style, with a candle-lit rooftop deck and beautiful tiled interiors. 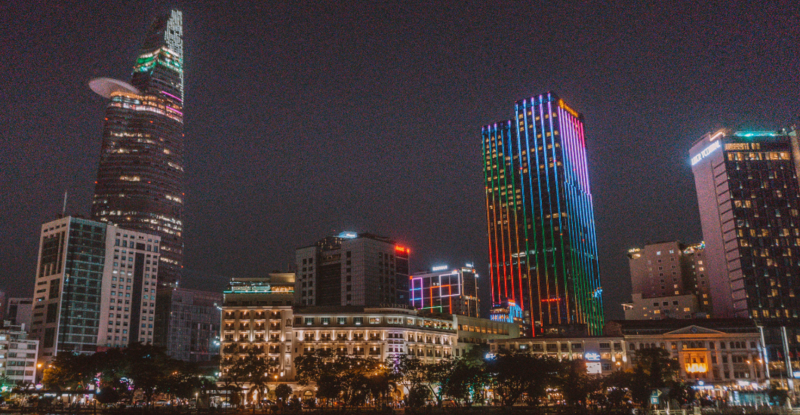 If it weren’t for the neon lights illuminating the skyline, it would be easy to imagine being back in time, before the hustle and bustle of modern Ho Chi Minh city. After a quick welcome drink, the band started playing and we pulled out of port, ready for our journey along the Saigon river. Let’s get down to the most important part of any evening: the food. 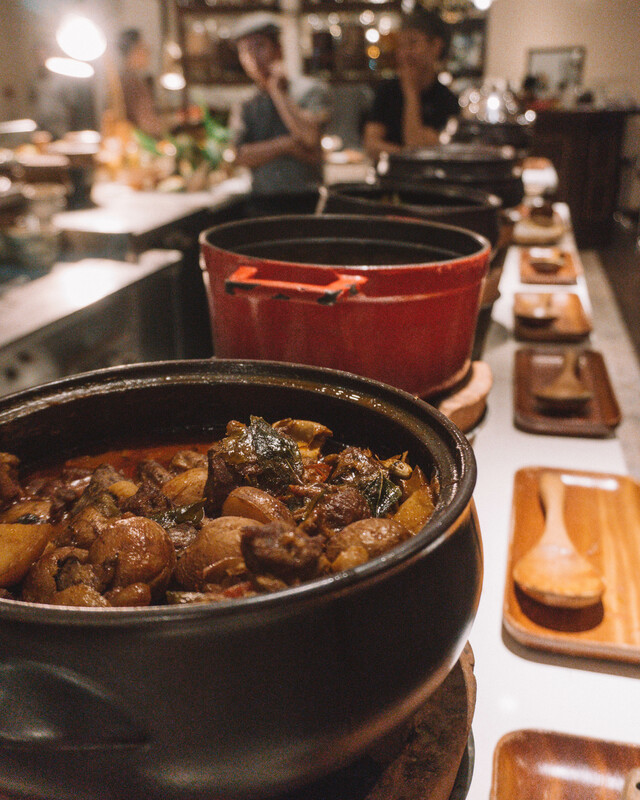 I’m a self-confessed foodie and I was really impressed! These types of tours are often more about entertainment, so I was pleasantly surprised by the large variety of high quality food to try. 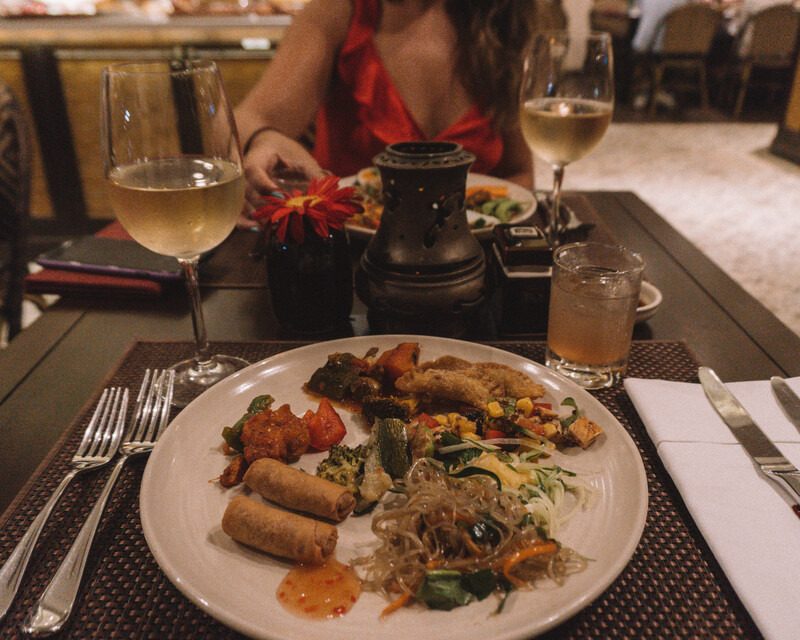 The menu continues the Indochina theme with a variety of different cuisines on offer from the region, including Vietnamese, Thai and Korean. There was also a selection of European dishes, like bruschetta and pizza, and plenty of vegetarian-friendly options to choose from on both the European and the Asian menu. 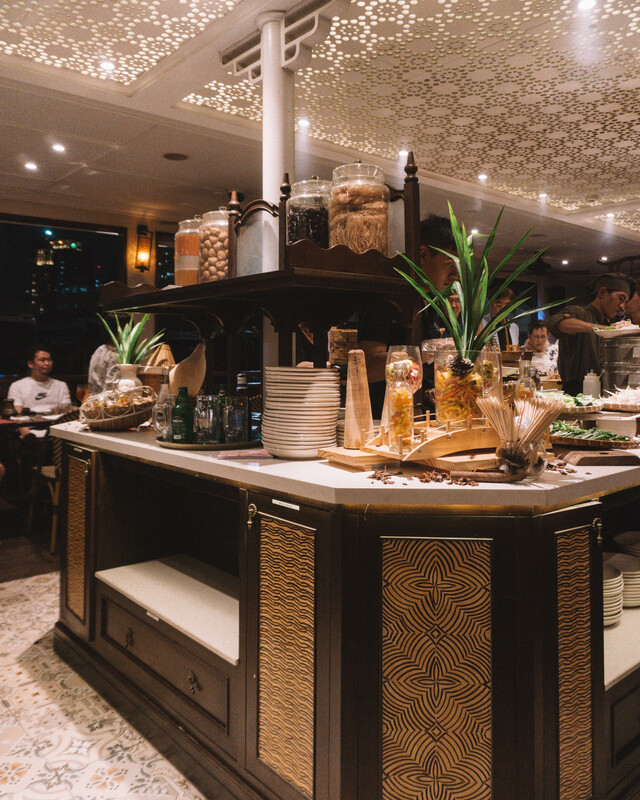 While most of the food aboard the Bonsai is buffet-style, there are a number of interactive stations where you can watch the chef make food specially for you! 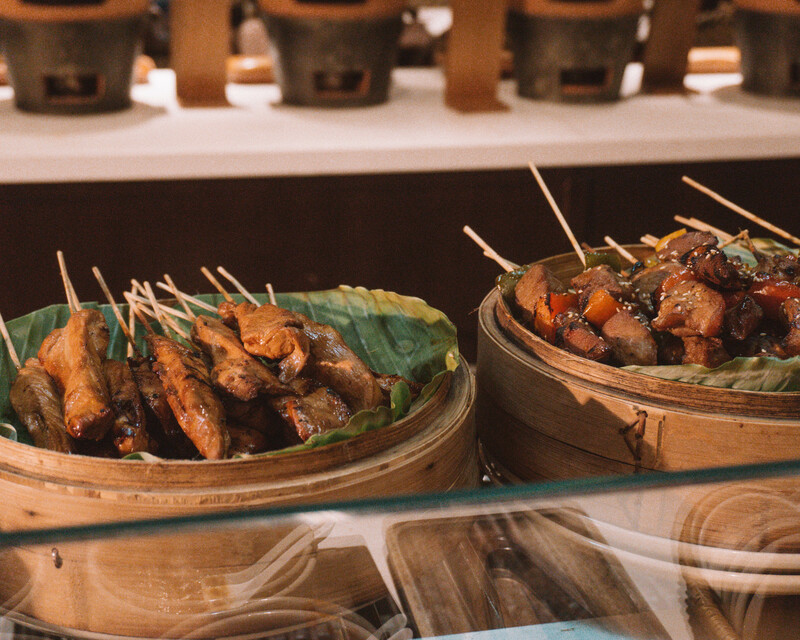 These stations were for dishes like Pho, Thai noodles, a carving station with a huge chunk of slow roasted meat and so on. As well as being able to watch the chefs up close, you can specify what to add or omit from the dishes (perfect if you are a fussy eater!). Another great element of the food service was that everything that needed kept cold was kept in chillers, and things that needed kept hot was bubbling with flames under them! This meant all the dishes were the perfect temperature, avoiding a common pitfall with buffets. There are two options for dining on the Bonsai – you can either do the regular dinner cruise which includes one complimentary drink, or the all-inclusive package which includes unlimited drinks. We did the regular cruise which was perfect for us as we don’t drink a lot. Drink prices were reasonable; wine for around 150k per glass, cocktails for 140k, beers for about 70k. So unless you plan on making it a huge night of drinking I would recommend doing the regular dinner cruise and buying extra drinks from the bar! The Bonsai Cruise is definitely more of a dining experience, with live entertainment all evening. During our meal the live band played a mixture of music from pop to old classics. We were super impressed to hear the singer switch from English to Vietnamese to Korean! The band really catered for everyone in the audience. Following the buffet was a series of traditional performances. There was a guy playing the most unusual instrument I’ve ever seen – it was like a xylophone made of rocks! My favourite entertainment was definitely the traditional dancers, who looked to be from one of the northern minorities (guessing from the traditional costumes). 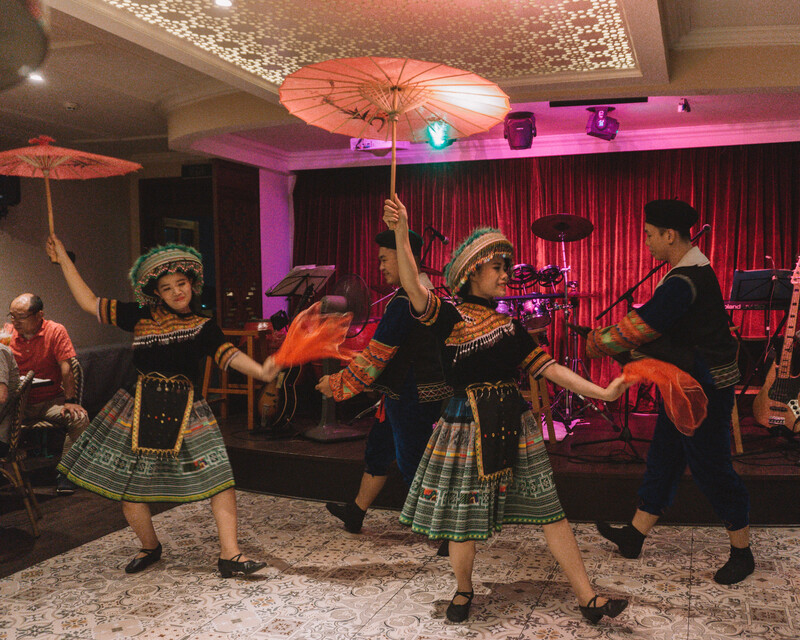 This was my first time ever seeing dancing like this in Vietnam and it was mesmerising to watch! Their costumers were beautiful and the couples were so well synchronised in their choreography. There was even a chance to join in at the end! As we headed back into port I spotted a magician doing tricks. Magic tricks always blow my mind and I still have no idea how he did them! Ending the evening with some magic tricks was the perfect way to finish up our Bonsai cruise. If, like me, you are starting to think more consciously about your travel experiences then you will be delighted to hear that Bonsai pledge to be eco-friendly and ethical in the sourcing of their food. You can book your own Bonsai Cruise experience on their website, picking from the regular dinner cruise and the all-inclusive cruise. 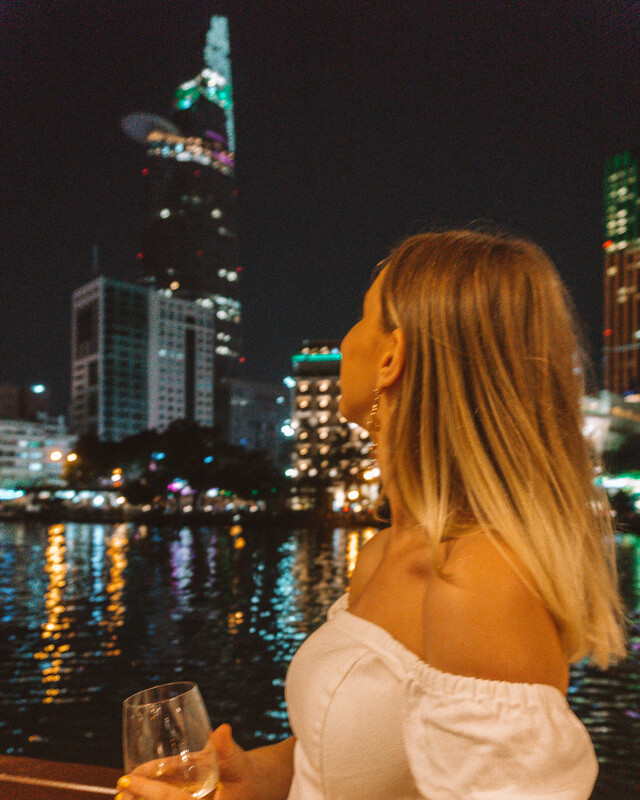 We had such a nice evening abroad the Bonsai river cruise, watching the Saigon skyline float by!